Cyan and Obduction are showing up in the news more often. Eurogamer.net has an interesting article: Myst connection: The rise, fall and resurrection of Cyan. The story about Cyan, Myst, and Uru isn’t told quite as I remember it. It is encouraging to hear Obduction is moving toward console gaming. Posted in Obduction. Tagged News. Obduction – Of course games. This is a big Myst sibling puzzle game where you are magically transported to an alien world and have to figure out how to get home. The graphics are awesome. All versions of the game will have VR support. The game is out and the VR updates will be sent along. Sketchfab: Largest Social Media Site for 3D Objects Adds VR Navigation – This is the first web site I’ve heard of that is designed for VR. The highlight isn’t the VR oriented content but the VR oriented site design. Hospitals Try Giving Patients a Dose of VR – They are using VR to help with pain management. It’s a distraction thing. Paraplegics regain some feeling, movement after using brain-machine interfaces – Surprising. Gear VR – Samsung is selling their nice headset for the Note 7 for US$99. I am eligible for a new phone… tempting. Politicians and Photo-Opts – I didn’t see this one coming. I’m hoping Wiener doesn’t find out about VR. Today is the day. If you are a kickstart supporter you should be getting an email with the download instructions. I got mine today. 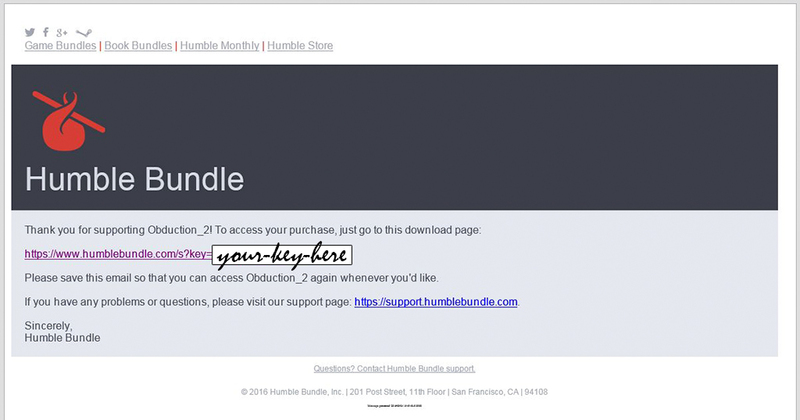 Click the enclosed link to Humble Bundle then choose Steam or GoG. I went with Steam. If you haven’t used Steam for a time, I haven’t, their directions aren’t that easy. The discussion over on the Myst and Obduction forums is about whether most of the people will need a new computer or not. The minimum hardware requirements are pretty high. See: Cyan Worlds’ Obduction July Release. There is enough of a commotion about hardware the Cyan Worlds peeps have posted: Obduction VS. Hardware. Mike Dogherra explains his experience with the game. He doesn’t address the Oculus Rift aspect, which I think is why we see such high specs. While I could be wrong, I think much of this is about Cyan covering their butts and controlling expectations. They do not want to get ripped on for giving people simulator sickness. Cyan Worlds is the maker of the Myst series of games. A couple of years ago they started a Kickstarter project named Obduction. Obduction will be the first PLAYABLE VR game released. I think the definition of playable is probably the key to that statement. Quoting: Welcome to Obduction, Cyan’s highly anticipated spiritual successor to Myst. This teaser trailer finally pulls back the curtain for a sneak peek of what to expect. Obduction is scheduled for release in June 2016. Posted in Games - Other, Obduction. If you are a long time reader, you know I came from the Myst gaming community. I am a big fan of Myst Online: Uru Live. Cyan Worlds the maker of Uru has been working on a new game for a couple of years: OBDUCTION.